58 D I V E R S I T Y W O M A N Fall 2014 d i v e r s i t y w o m a n . c o m DW Life > Use free online tools, such as itsdeduct- ible.com, to help calculate the value of some donations, recommends Kevin Gal- legos, a vice president with the Freedom Financial Network, which specializes in consumer credit advocacy. Summer and fall are great times to clean out closets and make donations. Plan to spend fexible spending ac- count (FSA) dollars. An FSA can reduce your tax bill by letting you use pretax dol- lars for medical care and/or child care. If you don't use the money in your account by the end of the FSA year, you lose it. An individual may contribute up to $3,300 per year; a family, $6,550. Next, look at your 2013 return. "What worked well and what didn't?" asks Mark Luscombe, principal analyst in the tax and accounting group with CCH, a pro- vider of tax and accounting information. "Were there deductions or credits you should have gotten but didn't? Adjust ac- cordingly." If you got a big refund, don't pat yourself on the back. "You should have a low refund," Luscombe says. "Oth- erwise, you're giving the government a big loan. 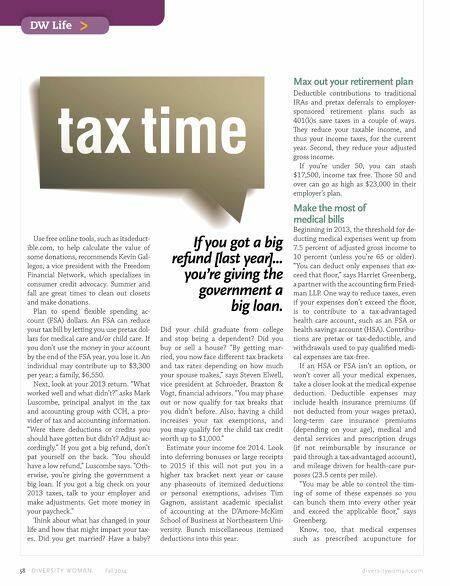 If you got a big check on your 2013 taxes, talk to your employer and make adjustments. Get more money in your paycheck." Tink about what has changed in your life and how that might impact your tax- es. Did you get married? Have a baby? Did your child graduate from college and stop being a dependent? Did you buy or sell a house? 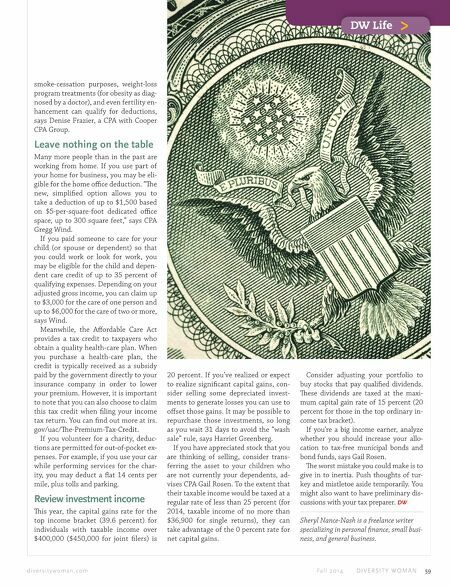 "By getting mar- ried, you now face diferent tax brackets and tax rates depending on how much your spouse makes," says Steven Elwell, vice president at Schroeder, Braxton & Vogt, fnancial advisors. "You may phase out or now qualify for tax breaks that you didn't before. Also, having a child increases your tax exemptions, and you may qualify for the child tax credit worth up to $1,000." Estimate your income for 2014. Look into deferring bonuses or large receipts to 2015 if this will not put you in a higher tax bracket next year or cause any phaseouts of itemized deductions or personal exemptions, advises Tim Gagnon, assistant academic specialist of accounting at the D'Amore-McKim School of Business at Northeastern Uni- versity. Bunch miscellaneous itemized deductions into this year. Max out your retirement plan Deductible contributions to traditional IRAs and pretax deferrals to employer- sponsored retirement plans such as 401(k)s save taxes in a couple of ways. Tey reduce your taxable income, and thus your income taxes, for the current year. Second, they reduce your adjusted gross income. If you're under 50, you can stash $17,500, income tax free. Tose 50 and over can go as high as $23,000 in their employer's plan. Make the most of medical bills Beginning in 2013, the threshold for de- ducting medical expenses went up from 7.5 percent of adjusted gross income to 10 percent (unless you're 65 or older). "You can deduct only expenses that ex- ceed that foor," says Harriet Greenberg, a partner with the accounting frm Fried- man LLP. One way to reduce taxes, even if your expenses don't exceed the foor, is to contribute to a tax-advantaged health care account, such as an FSA or health savings account (HSA). Contribu- tions are pretax or tax-deductible, and withdrawals used to pay qualifed medi- cal expenses are tax-free. If an HSA or FSA isn't an option, or won't cover all your medical expenses, take a closer look at the medical expense deduction. Deductible expenses may include health insurance premiums (if not deducted from your wages pretax), long-term care insurance premiums (depending on your age), medical and dental services and prescription drugs (if not reimbursable by insurance or paid through a tax-advantaged account), and mileage driven for health-care pur- poses (23.5 cents per mile). "You may be able to control the tim- ing of some of these expenses so you can bunch them into every other year and exceed the applicable foor," says Greenberg. Know, too, that medical expenses such as prescribed acupuncture for If you got a big refund [last year]... you're giving the government a big loan.